I’m not a fan of this race. Contested by class horses that always look good. How can you pick a standout? 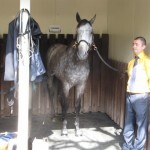 Fawkner looked great in his stall, relaxed and all dappled up. And I love it how Gai brings a bale of straw to the races to make her horses feel like they are at home in their stall. But I don’t like it if the strapper is not paying attention and the horse, in this case Wandjina, starts to eat the bedding! 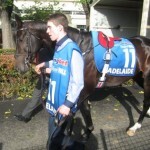 Adelaide looked the goods, with two strappers, an Irish martingale and the cross-over nose band. 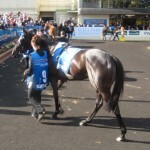 And Silent Achiever was a picture of fitness in the mounting yard. I couldn’t fault Sacred Falls, Happy Trails and Foreteller. The people’s horse, The Cleaner, was a bit fidgety. My final three, in order – Fawkner, Silent Achiever, Happy Trails. I decided to be boring and backed Fawkner for the place. A good Melbourne Cup run, you would have to say. 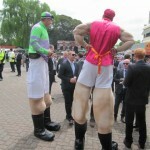 And if the world’s best jockey Ryan Moore had not won the race on Adelaide he would have been pilloried for asking the impossible and slaughtering the horse! What a disaster. I hopped off the train at Caufield and proceeded some 200 metres towards the track when I realised that my hat was still sitting on the train to Frankston. Oh, no! Panic. I’m lost without my hat. What to do? Call for help! Ring The Missus! “Well Geoffrey, what you must do is go back to the station and advise the staff that your hat is on its way to Frankston and could they kindly retrieve it, please”. She’s always full of good advice, The Missus. So I trudge back to the station and report the missing hat and leave my phone number, in case of a miracle. It is always hard to recover after such a poor start. And so it proves. But my first job is to apply sunscreen to all those parts of my head now exposed to daylight and not covered by the comb over. My second job is to look at the Cup horses. I check out the topweight Admire Ratki. Nice purple ear muffs, but he’s all over the shop. Hand held, restless, head shaking, rearing, pawing and occasionally having a kick. Not my sort of horse. I like my stayers to be calm and relaxed. 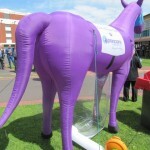 This horse is clearly frustrated in the tie-up and keen to get on with it. I try to video him but only manage a short burst. I keep returning to his stall after every race and his behaviour doesn’t change. I glance at my mobile and there’s a missed call. Hmm. I dial the number. “Caulfield?” “I was wondering if you have found a lost hat?” “Wait a minute, mate. Is it a scungy, daggy, greeny-grey canvas thing?” “That’s it. I’ll be there in ten minutes!” So back I go to the station. I can’t believe it. I shake everyone’s hand. Please pass on my congratulations to all the Metro boys at Frankston! Back at the track in time to see the parade. Admire Ratki still has the earmuffs, but now a stallion chain as well. My final six relaxed horses for the Cup trifecta are Junoob, Moriarty, Lucia Valentina, Rising Romance, Brambles and Araldo. You know the rest. I had the trifecta all wrapped up at the 100 metre mark until that blooming stallion swamped them. Five of my six horses were in the first seven! You’d have to say Admire Ratki will be hard to hold out in The Big Cup. On the train home I’m holding tightly onto my hat, a losing day, but I’m feeling like a winner. I’m lost without my hat. One of my favourite days of the year. There is a touch of anticipation and excitement in the air, the quality of the races is most excellent, and the crowds are quite tolerable. And I can usually get a spot on the second row back at the mounting yard, whereas next week I’ll be lucky to see through the hats. I keep my powder dry for most of the day. My eye still feels a bit rusty and in need of a conditioning run. But I break out with a lay bet on the favourite Lumosty in the Thousand Guineas when I spot the bar plates. No, no, no! I take $1.70 the place, six minutes before the jump! The horse got checked and jumped away last, but ran home OK for eighth. Maybe the check was the reason for the poor run and not the bar plates. Maybe I was just lucky. Whatever. I skip the Guineas. Rich Enuff is a standout, prancing around with an arched neck, two strappers and slightly sweating up. 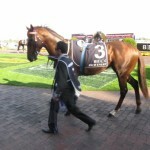 Looks like a good horse, but too short to back at $1.30 the place. The horse was just worried out of the prize. I hang around for the mares and my patience is rewarded when Griante streets them. 6.15 pm! What am I doing here? Collecting, that’s what! First day back and I jumped straight in on the two-year-old favourite in the first, Mali Rose. The horse fizzled out after looking likely and was later reported to be lame. Not such a good start to the new season! In the fourth Staviva looked the goods but just faded on the line for fifth. None out of two. This is starting to look ugly! The Turnbull looked too hard, so I saved myself for the mares and May’s Dream saved me by just falling into third. One out of three, for a loss on the day. Obviously I’m carrying too much winter condition and need a run or two before I reach peak fitness.